...Ok, well eight years ago today. Who would have ever thought I'd be where I am now! Tyson is everything I could ask for. Caring, gentle, understanding, supportive, kind, thoughtful, hard working. He spoils me to no end, but keeps me in check so it doesn't go to my head. I feel that we both share the family responsibilities equally, although he would probably disagree, because he seems to brush all three of the kids teeth, every night. I can't help that they prefer him to me. :) Anyway, I just wanted to let Tyson know how much I love and appreciate him and wouldn't trade him for anything. Is that sappy enough for ya? p.s. sorry the picture isn't the best quality. I don't have them saved to an electronic file, so I had to take a picture of the picture. Oh well. All I have to say is thank goodness BYU has some Saturdays they don't play. Not that I don't thoroughly enjoy watching football, I really do, but its nice to have an entire day to be able to stay focused on little...or not so little projects. At the beginning of the summer, we had someone offer to finish the other side of our basement. Well, we were hesitant because we weren't really looking to finish it, but since starting my coupon savings, our food storage has really picked up, so we decided to let him finish a storage room. Well, things happened and it didn't get finished...until today. Thanks to my wonderful, loving, patient husband who finished this little room that will make a HUGE difference to organizing my food storage and keeping things out of the way. So these pictures are what we spent our bi-week from football doing. Happy day!! This is the finished side of the basement after we unloaded all three shelving units to be able to move them into the new storage room. What a mess!! More of that same mess! Not completely cleaned up, but we're getting there. More storage room and food! Do you think we have enough cereal? The other side of the storage room. My very exhausted husband after a hard day of manual labor. Who would have ever thought I'd be so excited for a storage room!??!? We made it through another week. This week wasn't so bad, Saturday we actually had some breathing room. I actually got my grocery shopping done on Saturday instead of having to wait until Monday. I don't mind shopping on Monday's but its a lot better to only have the baby with me. We actually went to bed last night to a very clean house. The only thing that didn't get done, was folding the laundry, which takes its own precious time to get done. I HATE folding laundry, it seriously is the bane of my existence!! If anyone wants to torture me, just put me in front of an endless line of laundry needing to be folded!! Right now we are on the count down to the kids being off track. Yes, we have one week of school left before three weeks of craziness. And I'm not quite sure how I'm going to get anything done with four kids home. Not that I don't love my kids, but it sure is a lot easier to run errands when I only have Jake and Jefferson. The good news...Jefferson will be three months on the 4th, so I'll be able to take all of the kids to the gym! Happy Day!! And long overdue. I never thought I'd get to the point in my life where I would miss working out so much. I'm just going to have to hope that Jefferson can handle being with the daycare for two hours. We'll see how he does. Friday night, Tyson spoiled me and took me on a date that was focused 100% on the things I would enjoy. We went to Body Worlds. Let me just tell you, it was amazing! After that we went to dinner at this very good and very expensive restaurant. Flemming's Steak House. Mmmm Good. He had a gift certificate given to him at Christmas last year and he wanted to keep going while I was pregnant, but I told him I wanted to wait so I could actually eat the food and enjoy it. And that we did! It wasn't a cheap night, but very worth it. Anyway, I'm posting some random pictures. Mostly just Jefferson, because he's getting so big! I pulled the saucer up from the basement and while he sits in it fine, he really just tolerates it at this point. He's still a little wobbly to really enjoy it and doesn't quite know what to do with the toys. He'll grow into it thought. I'm not quite sure what Tyler and Jake were doing, but I do know they wanted in on the pictures as well. Jake loves that Jefferson is on his level while in this little toy. Check out the chunky arms!! Jefferson has discovered his hands and they are always in his mouth now! Well, these have definitely been a work in progress!! Trying to get craft projects done with four kids is proving to be a challenge. When my sister Cymony first told me she was pregnant, she told me, Micah, her little girl, loves the two blankets I gave her, so I better make at least two blankets for her next baby. Well, there is nothing like waiting until the last minute! My mom leaves for Germany to be with Cymony when she has baby number 2 this next week. I told Tyson Wednesday, I was dedicating that day to getting her blankets done, so not to expect much in the form of a clean house. I finished the second blanket Friday afternoon for my mom to close the corners on. Anyway, I just thought I'd post them 'cuz I think they turned out pretty cute! But I might just be biased. :)The pink blanket is just an extra one that has needed to be finished for a while, and I figured since I had my sewing machine out, I may as well finish it as well. This is my favorite! So much, that I made one almost exactly like it for Jefferson. Sorry Cymony! But Jefferson's has a different back. His has Brown bumpies. Its SO soft! The back of this one doesn't look like it goes very well with the rest of the blanket, but it looks really cute in person. Plus its super soft, and that's all that matters, right? Well, we made it through another crazy weekend, with every minute accounted for. Our Saturday started at 9:45am. Tyson and Tanner had a baseball game, it lasted for an hour. At 11am, Tanners party started, it went until 1pm. At 1:30, we had the BYU football game, which they won, YEAH. And to end the day, we had a primary ice cream social at 6:30. I seriously don't know when our days got so busy, but again, looking at this week, its just as crazy. But enough about how busy our lives are. Now for the real reason for this post. Tanners fun pirate party on Saturday. We told him he could invite 7 kids, one kids for each year of age. Problem was, by the time we came up with 7 kids, we had just over half of his 1st grade class invited, so we just decided to invite all of them rather than have someone with hurt feelings. It worked out well. We ended up having ten kids over. Once everyone got here, we started a treasure hunt that my mom helped me with. She is so clever when it comes to riddles and rhymes. I asked her to help and two hours later, she emails me nine clues to find a treasure! I think the kids had fun. My great sister was up here helping me, otherwise, there was no way I would have been able to pull it off. She decorated the cake so cute, you would have thought it came from the store, but I didn't have to pay $25 for it, and it looked much cuter. Its a treasure chest on a beach. So, so cute!! We found our treasure, then came home for pizza. After that, we opened our treasure, (hitting a treasure box pinata) picked the "gold" (candy) out of the grass and came in and had cake and ice cream and opened presents. All the kids went home with a bag full of candy, a pirate patch, a hook and a pirate bandanna. There were some other little things in their goody bag as well, but just random things. It was a fun day. And now Tanner has more toys than he knows what to do with. Yeah for my birthday present to help organize them!! Easting pizza! Hunting for "gold" (candy) in the grass. I can't believe Jefferson is two months now! I took him to his two month well baby check on Monday. When we got there, the nurse measured him, weighed him and took his head measurement. After that, we just waited for the dr. Well, when Dr. Moskowitz came in, he was looking at his papers and asked "Where did this boy come from?" He then proceeded to tell me his percentiles. For his head, he's in the 63rd percentile. 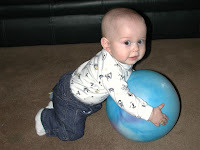 His length, he's in the 75th percentile and last but not least, he's in the 94th percentile for his weight!! Where DID this kid come from!! You have to understand why I'm so floored by his numbers. Tyler, even being our most "solid" kid has never been any bigger than the 25th percentile for length and maybe at her peak was in the 30th percentile for weight. Neither one of the boys have ever been anywhere close to coming out of the 25th percentile for anything. And Jake is below the 3rd percentile in his weight. Head size though, has always been an 80-90 percentile range for all the kids. So you can imagine why the dr. asked where Jefferson came from. He is obviously, by far, my biggest kid. Its crazy!! But he's still as cut as ever. So this isn't the most flattering picture, but it has one of the better double chin shots! By the way, since he is so big and Jake is so small, they are five pounds away from being the same weight! Tyson and Jefferson just after his blessing. Tanner at 2 weeks old...wow he's grown!! Waking Tanner up to "Happy Birthday to you!" 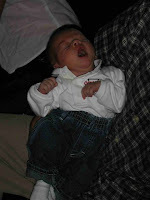 It was seven years ago tonight that Tanner VanNeldon was born into our family. He's been such a good and easy kid to raise. He takes the roll of older brother in stride. Sometimes its hard for him to be the oldest, but he takes those hard times and learns from them. He's such an articulate kid. There are times that he seems years ahead of his real age. He gets along so well with his younger sister and helps out more than he'll ever know with his two younger brothers. He wants to do well in everything he does. After four weeks of spelling tests, he's gotten 100% on all four of those tests. Tanner with impetigo on his cheek and a beesting under his eye. Poor kid! Everytime one of Aut Carli's friends sees him, he has a new ding on his face. I swear we aren't beeting him!! This morning, we woke Tanner up and sang Happy Birthday to you, which was always a family tradition in my family. I wanted to make his day special, so took him a McDonalds happy meal for lunch today. That didn't make Jake and Tyler too happy, but they got over it. When he got home, grandma Stauffer came and took him to Color Me Mine and helped him make what grandma called a Santa cookie plate. We'll have to wait a few days to see it. Its funny how I remember having some of the "olderst Child" conversations with my parents, that we are now having with Tanner. It will be hard at times, but Tanner, I'm glad you came to our family and are such a good example to the rest of the kids and even your mom and dad. I love you buddy! Well, all I have to say about this weekend is I'm glad its over. I swear, we had a million things going on. And as I sit here writing this, Tyson is going over the events of this next week, and it doesn't slow down at all!! Our weekend started Thursday night when all of Tyson's family met at the Residence Inn to kick off our family reunion. We had a bbq and cake, then those who wanted to swim, went swimming and the others either went to bed, or watched Kung Fu Panda. Cute movie by the way. Friday morning, we all woke up and went to breakfast in the loby and headed off to Jordanelle Reservior for some fun on the lake. Our little family ended up taking off a little later. Tanner wanted to go to school so he could keep his 100% attendance record. By the time I got the trailer we were using, and everybody packed, Tyson was home from work and we took off. When we got to Jordanelle, Mckinsie and I got lunch ready and afterwards, Tyson took the kids on the boat and water tube. Jake loved it as did Tanner and Tyler. After they got back to shore, Tyson insisted that I go on te boat and ski. Can I just tell you how cold that water was? Even with a wet suit. Actually it wasn't all that bad, it was getting out of the water that was the bone chiller. It doesn't matter if its 100 degrees or 70 degrees, the wind on a boat still cuts to your center when you're wet. That night we had really good ribs and a fun fireside...by the fire. Uncle Josh assigned each family a story out of the scriptures. Our family was given Meeshack Shadrack and Abed nego. I know I just killed the spelling and I'm too lazy to get up and look it up, sorry. He had the kids do a fire dance and they had a lot of fun. With a big family, comes lots of cousins. Well, those who were two, had a hard time sitting still for this whole thing, so they were just wondering around. Well, as if we had rehersed it a million times, as Tyson was reading the part in the scriptures where the king was verifying they put three men in the fire, but there seemed to be a fourth, Tyson's niece walked right up and stood by the three kids, looking as though she were the fourth person. It was pretty funny and typing just doesn't do it justice. Tyson, Tyler and Tanner at Jordanelle waiting for dinner. I think something about his look here, resembles Bronco Medenhall...maybe its just the BYU hat. That night, we went to bed, and all froze to death. Word to the wise...never go camping in September in the mountains. We even took a trailer, but I guess I was so stressed and had a million things on my mind when I got the instrucions, that I missed the part about turning the propane on so we could have heat all night. So even those of us in the trailer froze, due to my absent mindedness. Sorry guys!! In the morning, we all woke up to a great fire, thanks Grandpa Lybbert and had breakfast. We packed up camp and headed home. Once home, it was a race to clean up, head to the store, and get our everything ready for Jefferson's blessing Sunday. Well, that would be great and all, but BYU had to throw a wrench in the day and have a football game at 1pm. Tyson surprised me when he said lets go. I thought for sure he would be worried about getting everything ready. When we got home, our house was clean. Ready for Sunday and we had nothing left to do. My wonderful sister and mom decided to help out and for my birthday came and cleaned my house. They will never know how much I appreciated it. However a part of me is somewhat embarassed that they felt my house was so messy, they needed to come in and fix it...but just a small part of me. Everyone was so tired from the lack of sleep the night before, that we put the kids in bed and they were asleep by 7:30. Sunday morning, we got up and ready. Tyson and Tanner headed out to do fast offerings at 9:30. They were back home by 10:30 and we headed to church for Jeffersons blessing. Tyson gave a very nice blessing, and after the meeting, we came home to delicious ham and huge baked potatos!! Seriously, these potatos were the size of a small child! Everyone was gone by 1:30 and Tyson headed back to the church to count tithing. He's holding a tent bag around his neck. I'm sitting here at 10pm typing this, wondering why I'm not maximizing the time Jefferson is asleep and going there myself. That's a good question. Good night!